Retool Your School is a book by Jim Lerman and Ronique Hicks. Check out this announcement from Jim Lerman…. Borders bookstore in the Garden State Mall in Paramus, NJ on Sat. Oct. 9 from 3:30-5:00. There will be fun and door prizes! 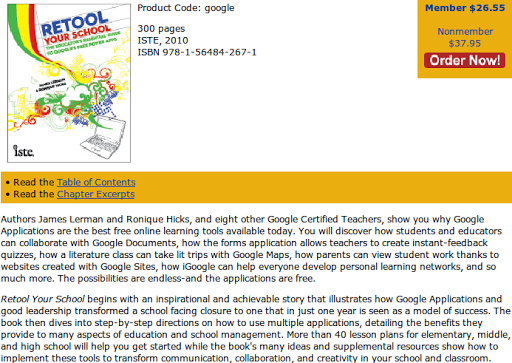 We’ll be featuring our new book “RETOOL YOUR SCHOOL: THE EDUCATOR’S ESSENTIAL GUIDE TO GOOGLE’S FREE POWER APPS”. Anyone read this book and can offer comments/feedback on it?